Next, head to the heart of Paris' nightlife, Montmartre, and the Moulin Rouge! 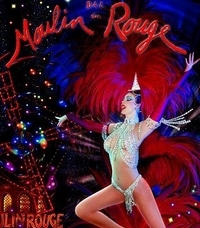 You'll experience the Moulin Rouge's new "Feerie" review and the essence of Parisian cabaret. A troupe of 100 artists, including 60 legendary Doriss dancers, will entertain you dressed in exotic costumes of feathers, rhinestones and sequins. The sumptuous sets and vibrant light show of "Feerie" provide a colorful backdrop for brilliantly choreographed performances on moving staircases, in a gigantic aquarium, on swings and in garden settings. Special Offer - Book online and save over 5% off the local price in Paris - Book Now!